In this year’s Marvel flick Doctor Strange, Tilda Swinton plays the Ancient One, a character that was originally Tibetan in the movie’s comic-book source material. Changing the race of the character was reportedly a politically-motivated decision “in large part over fears of offending the Chinese government and people — and of losing access to one of the world’s most lucrative film markets,” according to the New York Times. Of course, anyone with any familiarity with American pop culture knows that there is a dearth of Asian faces on screen, which made Swinton’s response to the controversy that resulted from her casting—“I wasn’t asked to play an Asian character”—come of as tone deaf. Like, sure, exactly. That she was asked at all is in stride with Hollywood’s overall apathy regarding diversity. 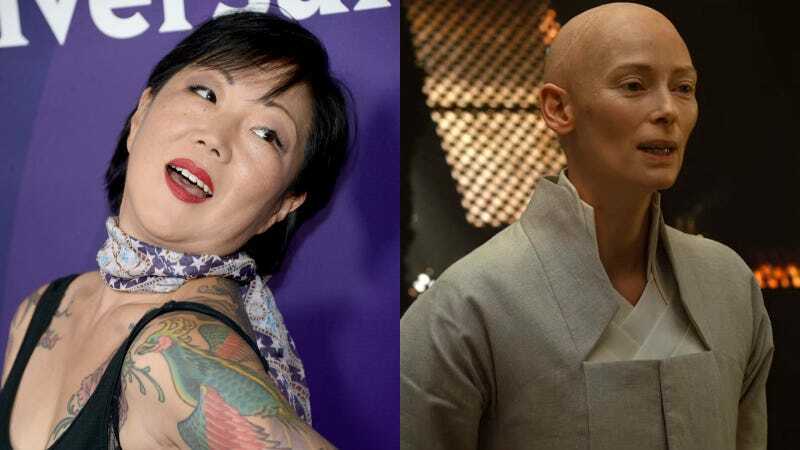 On his TigerBelly podcast this week, comedian/actor Bobby Lee discussed this tendency to rewrite characters that were once Asian as white (which also happened with 21) with his guest Margaret Cho. Cho, in turn, spilled tea on an argument she had over the phone with Tilda Swinton regarding the Doctor Strange dust-up. “Oh, like I have a black friend, I can do this...” is how Lee interpreted that. I reached out to Swinton’s rep for comment and will update this post if and when I hear back. Update: Swinton sent us a very thorough response. What will Tilda think of next!